Colorful & eye-catching, our delightful recycled metal tea frog garden art will always make you smile. 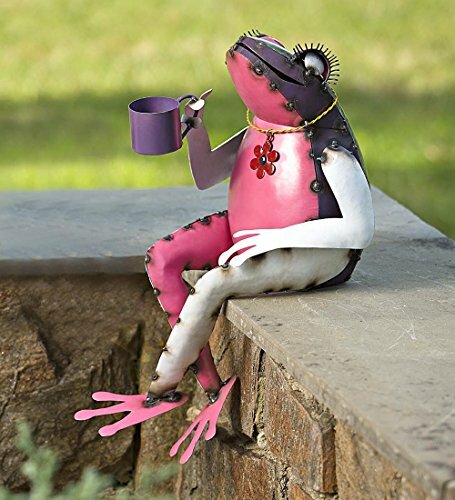 Complete with long eyelashes & a flower charm necklace, our frog garden statue makes a great conversationpiece. Place her near a garden walk, porch stairs, hearth, or anywhere you want a fanciful & fun accent. Each tea-sipping frog is handmade from recycled oil drums in Bali by local artisans, & each one is unique! seat this fabulous amphibian indoors or out - she is the perfect accent to spice up any space. Size: 12"l x 8"W x 151/4"h.Attention: this is an exclusive Plow & Hearth product that is only available from us. Please be sure to choose Plow & Hearth as the seller to guarantee you are receiving a product that has been properly constructed & tested & that is supported by our U.S.-Based Plow & Hearth customer service. No other sellers are authorized to offer this unique product on Amazon, & plow & hearth-provided warranties will be invalid for purchases through unauthorized sellers.